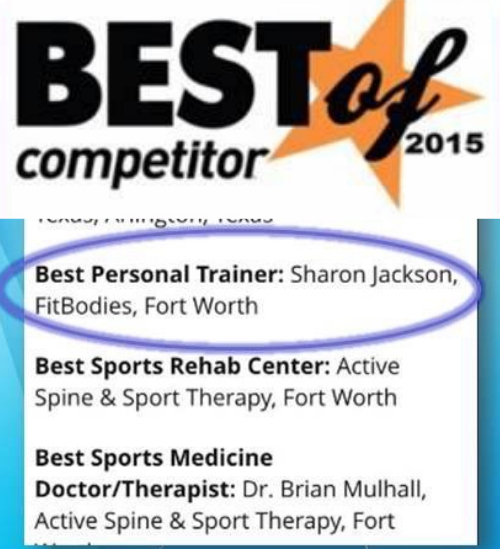 Top-notch personal training in Fort Worth! There is ONE GOAL: To help you live your best life. Coach Sharon wants you to live a healthier, happier and longer life. To make this goal a reality, she provides individualized training designed with customized exercise and nutrition plans specifically tailored to fit your needs. You will improve your overall health, endurance, muscle strength and quality of life. Maybe you’re tired of carrying around excess weight that slows you down and limits your mobility. It’s possible that having a closet full of clothes that “just don’t fit right” has grown more frustrating than you can deal with. Maybe your mood swings and depression have finally taken a toll on you and your family…Whatever the reason: YOU’RE HERE. You know something needs to happen to improve your life and the things you’ve tried in the past haven’t worked. Let’s take a look at what some of those things might be. DIET: With dieting, you get the initial satisfaction from shedding water weight and maybe even a few pounds. But 99% of the time, the weight comes back and when it does, it is usually MORE than what you had before you started. Dieting isn’t a lifestyle change. It’s a temporary fix to a permanent problem which is why it isn’t the solution for you. JOINING A GYM: ​The inability to lose weight and maintain a healthy lifestyle isn’t due to a lack of training facilities or gym memberships. Most of us have a place to workout…whether that’s your neighborhood gym or living room floor. It’s the lack of accountability and motivation that keep you from reaching success. DIY (DOING IT YOURSELF): Trying to determine what will work best for your body in the fitness and nutrition industry is like self-medicating instead of going to the doctor when you’re sick: sometimes it works, but usually it only makes things worse. With all the different information out there on what to eat, how to eat, when to eat and which workouts are best, it’s almost impossible to know which are the right things to do FOR YOU without the expertise and guidance of a certified fitness professional.